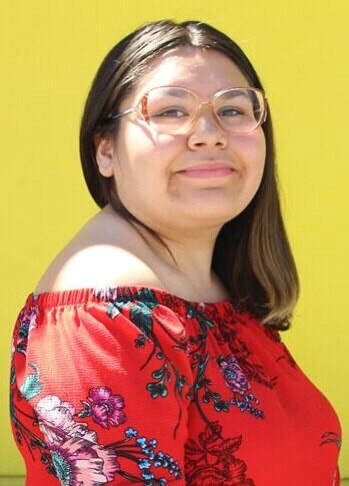 Andrea Paola Delgado is a low-income, first-generation, pansexual, fat femme, xicana living in The San Fernando Valley. She lived in a home where fatphobia, queerphobia, machismo, and mental health stigma were constantly present which led to self harm, suicidal attempts and frequent psychiatric hospitalizations. During those times she was in constant battle of loneliness and hopelessness as she found a release through comics, music, television shows, and anime. Through this she found LGBTQ+ representation and womxn empowerment stories and lyrics that made her understand her sexuality and strength that helped her rise up to find hope. Andrea is currently attending Los Angeles Valley College as a Psychology major in hopes of becoming a Marriage & Family Therapist to create comfortably safe spaces for LGBTQ+ youth. She is very passionate about educating others about mental health and how it is important to treat and care for it like a broken bone. She took on the Peer Counseling Training Program to become a Certified Peer Counselor- Life Coach to create and facilitate support groups to start the journey of breaking mental health stigma and creating a path of hope for youth. She was also invited twice to be a speaker at a Recovery Panel at the San Fernando Valley Community Mental Health Center, Inc at the Client Run Center (CRC) in the summer of 2017 where she spoke about her path to recovery and resilience. In Summer 2017, she joined Somos Familia Valle’s Pride Committee on organizing The 4th San Fernando Valley Pride March and Conference. She admired Somos Familia Valle’s passion and perseverance and drove her to be a pride committee member who was dependable and got the work done. She facilitated the Treat Yo’ Self- Care workshop and outreached To many people at many different events. She also spoke about her Coming Out story at the LGBTQ+ Youth Council. She knows that supporting LGBTQ+ people of color leadership is very important and wants to give back to the community.